We had a breakfast a few months ago at work and served these decadent bakery treats! I was so impressed I brought the idea home to Sir Wes, with the help of a recipe from The Novice Chef. I have to confess, I am not a bacon eater, which is just a personal preference but my taste testers all agree- they soooo good! They are kind of ridiculous, the kind of breakfast that stays with you all day. 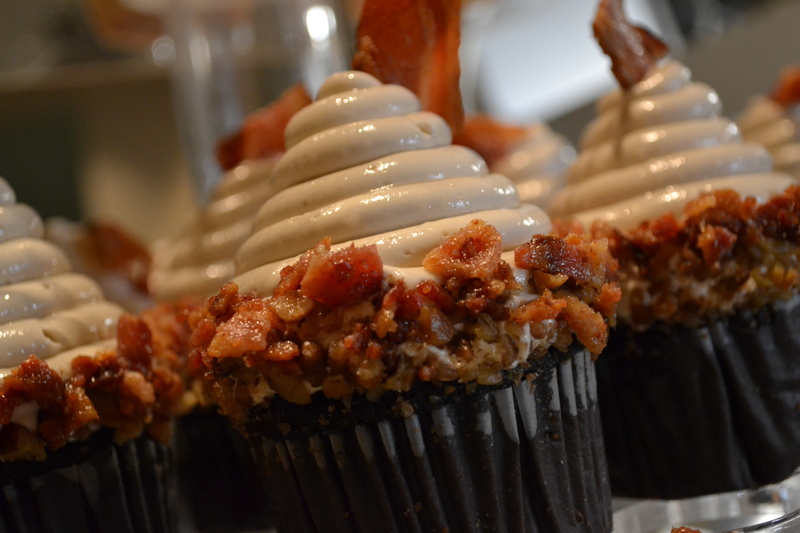 Recipe Notes: There are two important ingredients for this cupcake. First being the bacon, of course. Don’t cheat yourself by using turkey bacon…or worse…pre-cooked bacon! Use good, quality bacon. Trust me, it is worth it. And also spend the money and buy the pure maple syrup. I promise you that Aunt Jemima just ain’t gonna cut it in this recipe! 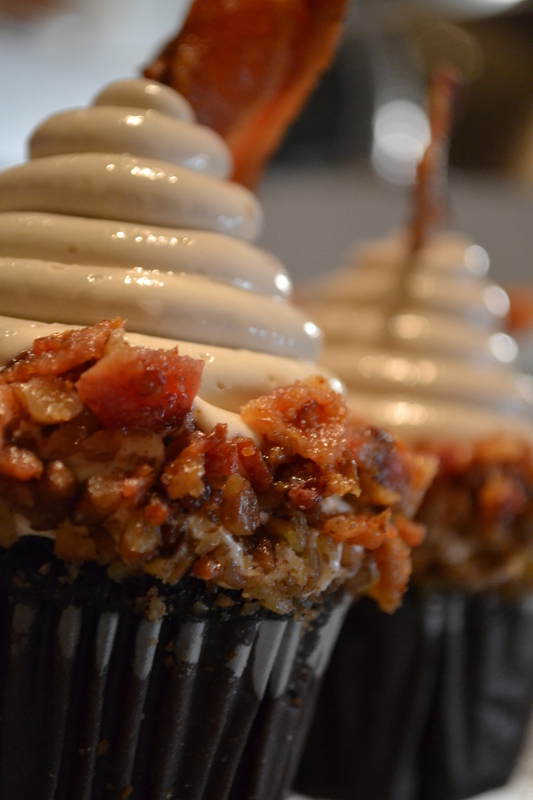 As Sir Wes says- "Bacon Makes Everything Better"
This entry was posted in Cupcakes, Recipes, Uncategorized and tagged Breakfast Cupcakes, Maple Bacon Cupcakes. Bookmark the permalink. ← Pretzel Bread Pudding – A Ballpark in Your Oven! I tried your recipe and it was delicious! Great! I’m thinking about locking up the oven! Kinda baked “out”! Oh yum! I love sweet and salty together. 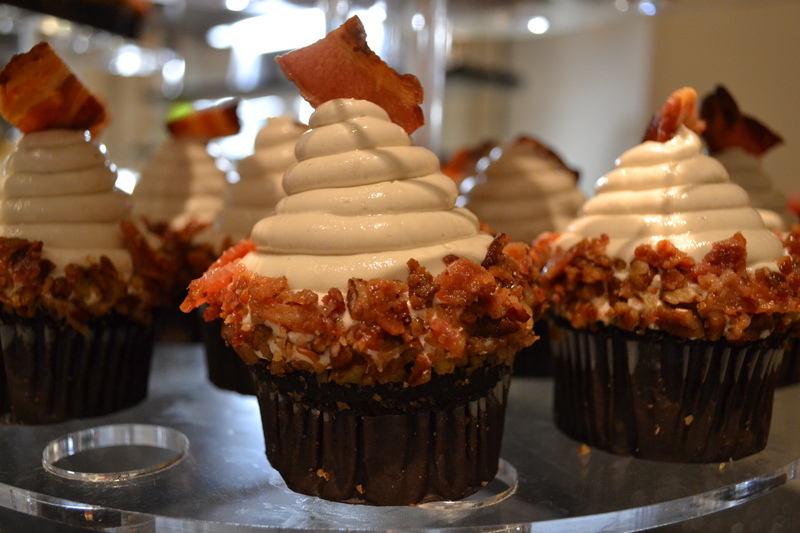 Chocolate and bacon in a cupcake! Yes please! I used to make maple bacon, so I’m sure that all of the flavors of this are outstanding! I completely agree-salty and sweet have an amazing marriage! I just made some…I just substituted Bobs all purpose flour with 3/4 tsb of x gum for the flour! Super yummy!! I just have to come up with the gluten free version and I am SO making these!! YUM!!! This was amazing! Every one loved them! OMG, love at first sight. This is absolutely perfect for my husband’s upcoming birthday, cannot wait to try them this weekend the kids are going to tear them up. OMG, it was love at first sight. I cannot wait to try these out this weekend for my husband’s birthday, I just know my little one’s are going to bash them. Anyone tried subbing chocolate for a different cake flavor? I’m not a big fan of chocolate. Maybe a maple cake? I betcha maple cake would be good too, brittanyj008. Maybe I’ll make them both ways. If you make them maple instead of chocolate please posts your results.